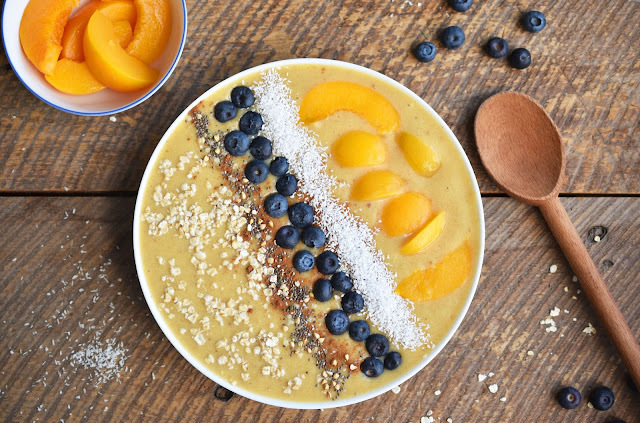 This Peach Pie Smoothie Bowl is the New Year's healthy answer to peach pie. 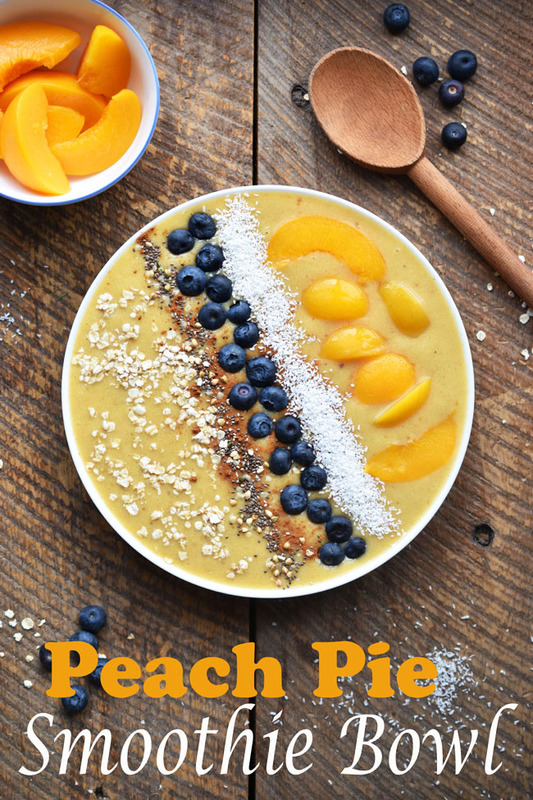 It's a tasty blend of California cling peaches, a touch of decadent coconut cream, bananas, Medjool dates and toppings like coconut, blueberries, oats, chia cereal and cinnamon. 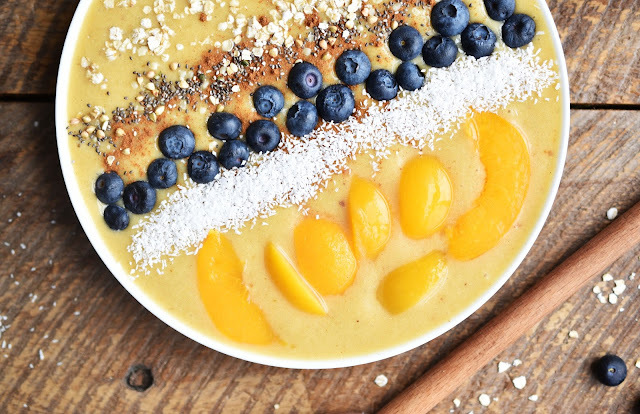 Besides being super healthy and delicious, this peach smoothie bowl is vegan and gluten-free. It makes for a great start to your day or even a satisfying evening snack. If you fill up on something healthy in the evening, you're sure to reduce junk food cravings. 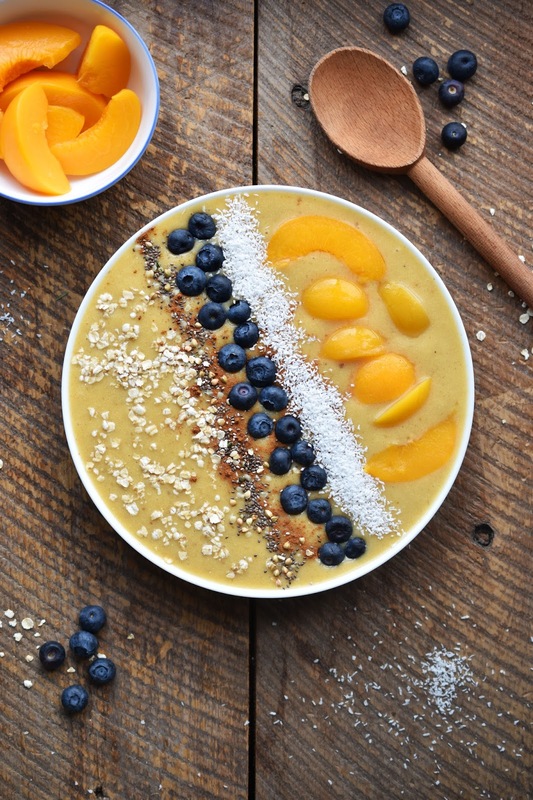 You can adjust the sweetness of your Peach Pie Smoothie Bowl by adding more or less dates. And feel free to play around with the toppings. How about adding cacao nibs, strawberries or granola cereal? I used to love eating peach halves from the can when I was a kid. I would spoon up the tasty juice from the middle of each peach half before eating the peaches themselves. Lest you think that canned peaches are not as healthy as fresh-picked peaches, never fear - California cling peaches are picked and packed usually within 24 hours. So they keep their texture, flavour and nutritional content. 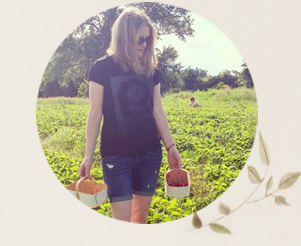 Strangely enough, the canning process has even been proven to increase key nutrients in your peaches, including Vitamin A, Vitamin C and folate. Essentially, canned peaches are like fresh - they retain their shape and firmness well, unlike thawed frozen peaches. 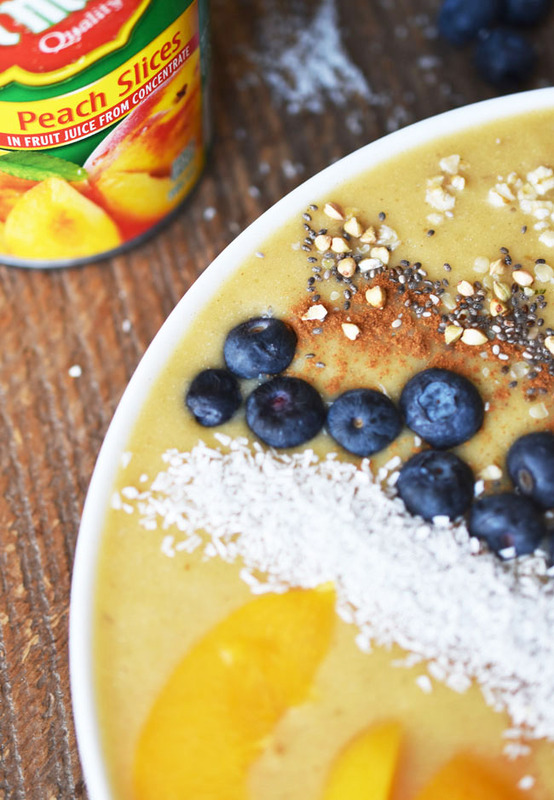 That means sliced canned peaches are a pretty addition to your smoothie bowl toppings. And you can always keep a couple of cans in your pantry cupboard, whatever the season. So go ahead, get your blender out and give this healthy, refreshing smoothie bowl recipe a try! My kids really enjoyed it and I was able to sneak some good nutrients into them without making a big deal out of it. Do the same for yourself. What toppings would you include on your Peach Pie Smoothie Bowl? Put all ingredients from peaches through to ice in a blender. Blend, slowing adding non-dairy milk by the tablespoon as needed to get the right consistency (thicker than a smoothie, not as thick as nice cream). Continue to blend until the mixture is smooth and all ingredients are incorporated. This could take a few minutes depending on your blender. Pour into two bowls and add toppings as desired. Looks like a plate of sunshine! I just purchased some great figs which I'd put on top! Fab idea Jan! Love it! I'm so glad smoothie bowls are a thing. They are so much more enjoyable to me than regular smoothies! I love topping mine with granola. I guess I like to have a crunchy component to chew on, haha. Oh my goodness this looks delicious. I love smoothies and smoothie bowls! I'd imagine this would taste great with a variety of toppings! I'd add lots of cinnamon, and some flax! Your toppings looks great but some spirulina or almond meal might be an idea! I love blueberries with peaches but would also add raw pecans and flax seeds! Yum! 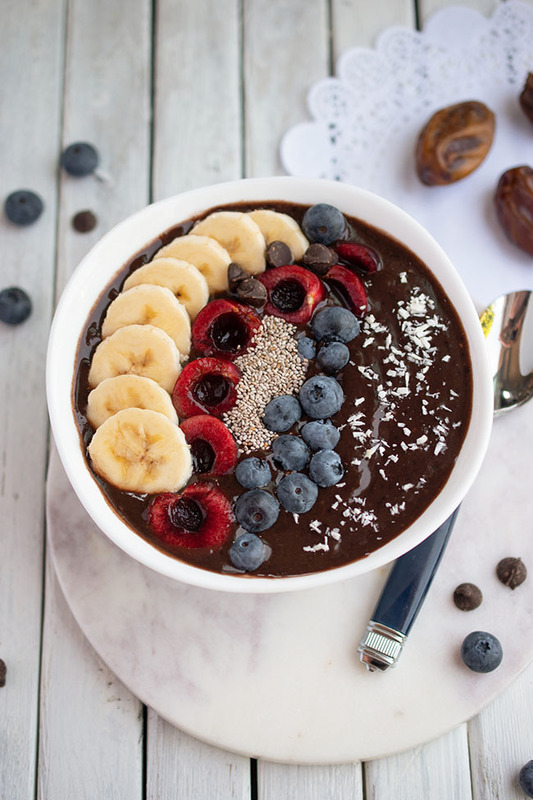 I've never thought of having my smoothie in a bowl but that looks amazing so I'm up for trying it. Thanks for sharing. I'd add some hemp seeds on top too! That would work nicely Rhonda! I would love to add walnuts and chia seeds to top it off!